XFS is a Linux filesystem which is typically used in ready-made NAS devices produced by various vendors. Buffalo chooses XFS as a main filesystem for its TeraStation NAS devices. Many other NAS vendors like NetGear, Thecus, LaCie, and others use XFS filesystem actively in their devices as well. As for DIY NASes, there is a tendency that people who are going to build NAS, more often prefer either one of the versions of the reliable EXT or the latest-fashion ZFS filesystem. simultaneous failure of XFS and md-raid. 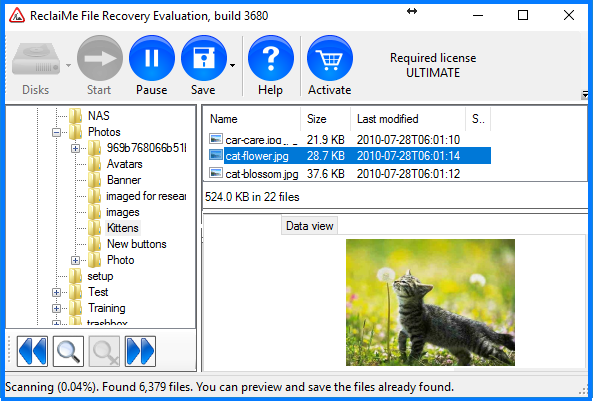 The first two cases can be solved by ReclaiMe File Recovery software , since the software can read XFS filesystem on Windows. Third case and severe cases of md-raid failure require both RAID recovery software to restore RAID configuration and data recovery software to extract data. 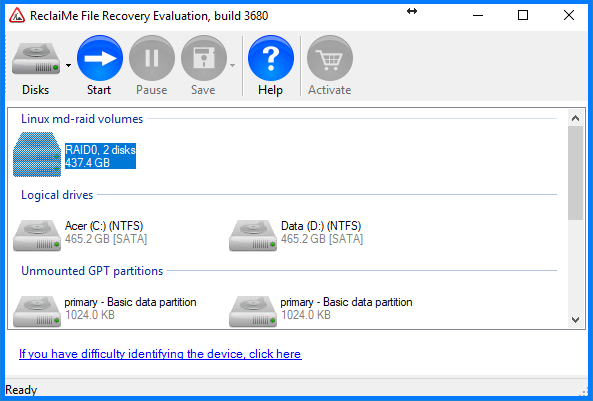 Launch the tool and select the volume or disk for recovery. If the disks were brought from the NAS device you see your XFS volume in the Linux MD RAID volumes section. If you see several volumes, select the largest one. Wait until the software completes the analysis and check the recovey result using the preview function. It is not required to wait till the end of the scan since ReclaiMe File Recovery handles XFS filesystem records first. If you are satisfied with the XFS folder tree and files you see, purchase the licnese key and start to copy the recovered data. If you do not see the needed XFS volume in the list of ReclaiMe File Recovery software, most likely, significant md-raid failure has occurred. If so, you need to recover RAID configuration using ReclaiMe Free RAID Recovery first and thereafter start XFS data recovery as described above. During the format the XFS filesystem driver divides a disk into groups, similar to what the EXT driver does. Each of these groups contains a superblock describing the general filesystem parameters. Each group also contains a whole number of other filesystem structures, most important of them being the inode table. Inode is a filesystem record describing some filesystem object like a file or folder. Each particular group has an inode table which contains inode records describing objects in this group. The significant difference between XFS and EXT is that inode tables of XFS have a variable size and location. So if an XFS volume is formatted, only minimally needed parts of tables will be overwritten, instead of overwriting the entire table as it would happen in EXT filesystem. Thus, a chance to recover XFS data is sufficiently high even if the volume was formatted.